Your all-in-one PIER 39 Attraction Pass includes admission to Aquarium of the Bay, Magowan's Infinite Mirror Maze, 7D Experience, a one-hour San Francisco Bay Cruise, and a ticket on the San Francisco Hop-on Hop-off Tour good for 48-hours. Save even more with additional coupons and discounts for many of the pier's restaurants and stores in the PIER 39 Fun Pack! Take advantage of prime photo opportunities with unobstructed views in every direction aboard Blue & Gold Fleet’s 60-minute Bay Cruise Adventure. 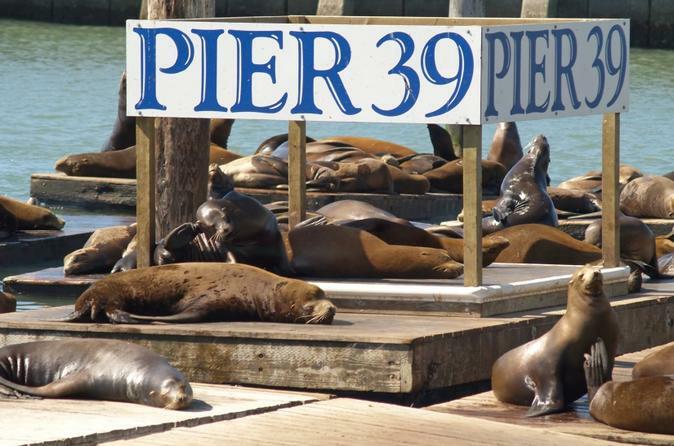 Sail past the famous PIER 39 sea lions and along San Francisco’s historic waterfront, revealing the city’s fascinating skyline. This comfortable San Francisco Bay Cruise tour has both indoor and outdoor seating with full narration describing major landmarks as you sail by them. You haven’t experienced San Francisco until you’ve taken a Bay Cruise. A free multi-language audio tour is available in nine languages. Get acquainted with the city and enjoy limitless flexibility with a hop-on hop-off pass good for 48 hours. Listen to live commentary on two separate tour loops through San Francisco's scenic neighborhoods such as Fisherman's Wharf, North Beach, Nob Hill, Downtown, Union Square, Chinatown and PIER 39. You have unlimited hop-on or hop-off privileges at any of the 15+ stops including the Golden Gate Bridge so feel free to explore San Francisco at your leisure. 7D Experience is sensory extravaganza combining the most advanced 3D film attraction in the world with cutting edge technology to deliver the thrill of a roller coaster and the excitement of an interactive laser blaster all without leaving your seat. With a state-of-the-art digital surround sound system, this immersive experience is guaranteed to entertain! You will also receive a PIER 39 Fun Pack with over 100 discounts, coupons and special offers to PIER 39's shops, restaurants and attractions. With seven days to use the pass, you have plenty of time to see it all during your San Francisco vacation.